I’m still feeling the pull in my chest from sobbing but I wanted to write a review now, I didn’t want to wait until morning. “When I read I like to give the author my undivided attention, I like to immerse myself in the world that has been created and if that means holding back on something I’m eager to feast upon then so be it, the rewards are immense… if only I could be so disciplined when it comes to food. 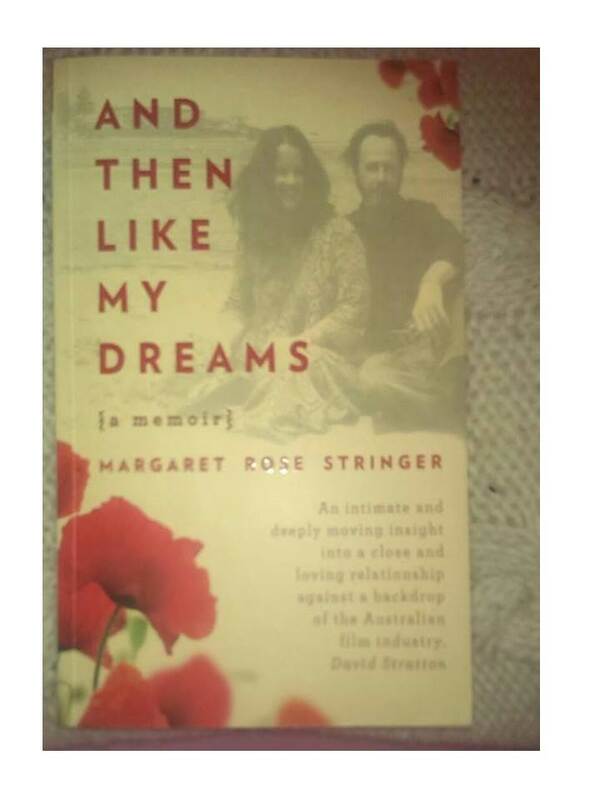 If ever I was justified in waiting for the right moment it was when I resisted the temptation to dip just one toe into the life of Charles ‘Chic’ Stringer (The Stillsman) and his simply unique wife Margaret Rose. To have missed out on the invitation to fully be a part of their life would have been a travesty. And Then Like My Dreams [a memoir] is not a book, it’s not a story it’s a letter from a friend who has never been able to open up to you before. It’s an offer you don’t get very often in life to share someone else’s amazingly gracious, loving, unassuming, talented, intelligent, calm, reassuring and totally devoted husband. M-R wants the reader to love Chic, because she wants him to never be forgotten. It’s as simple as that. She’s sowing Stringer seeds and growing a Chic crop and she is doing it so well. Her writing style is so simple, so honest and so unassuming and so humorous and yet so deeply moving, you just can’t help but fall into her world, her heart, her life and love. Oh and don’t doubt her intelligence, the cleverness seeps out at the turn of every page. M-R Stringer is a gifted writer be sure of that. I have laughed with Mr and Mrs Stringer, I realised I was tensed up with excitement and anticipation for them at times, I marvelled at their love of Italy and France my travelling spirit sated by the delightful feast of descriptions and accompanying colour images. I wept silent tears when she lost him. I sobbed as I felt her trying to cope without him. I felt an ‘nth’ of her pain and that was unbearable… but Chic chose a strong lady, the perfect lady, the love of his life and she’s doing him proud, there is no wonder that he loved her so completely. This isn’t just a love story, this isn’t just a memoir, it’s an education in life, it’s rare and it will become important to anyone who reads it. There are lessons to be learned, tons of them. It’s a travelogue, a history, it’s a journey, it’s a privileged invitation into their world. It’s about as big an honour as getting to have dinner with your idol and you even get invited to one of those too! Margaret Rose and Chic loved each other to the point of absorption, they were all things to each other, they were a sealed unit, there were no cracks, no gaps, there was no seepage and now it’s time for them to let others into their space, to sit and watch them have fun, tease one another, play, laugh, cook, plan, build, work, relax, travel and eat… let’s not forget the eating. Thank you M-R, from the bottom of my heart. I have so much more to say my review could run into volumes and I will share more of my thoughts but this seemed a good place to leave it for tonight. I’m sorry my links aren’t working properly it must be due to poor connectivity out where I am right now, I didn’t want to leave it before writing this. I’m on to your website now reading about your travels and then to look up Chic via the links you provided to his professional works. Set some time aside you won’t want to put it down. I started it a while ago but have been so busy and it’s been calling to me but I’m so glad I didn’t grab five minutes of it here and there, I’m so glad I waited and gave it my full undivided attention. You will not be disappointed. My Californian friend can shut his mouth 🙂 – relentless self-promotion this may appear to be, but I am totally THRILLED by this review ! 🙂 I could have written a book about your book, I probably will have done by the time I’m through telling everyone about it. Just loved it for so many reasons. My daughter snaffled it as soon as I finished it. She’s been patiently waiting for it and having witnessed my emotions throughout she’s become ever more curious and itchy to get her hands on it. When I finally handed it over she said “Don’t tell me what happens, don’t spoil the end for me mummy” I simply said “There is no end darling” and off she plodded already engrossed in the first page. When she’s finished I will tell her to settle for nothing less. Virtually rendered speechless … You most definitely nailed it, you deeply observant woman ! We are alike in more ways than one ! Tante grazie … merci de coeur … I am greatly in your debt. Oh yes. I was positively hyper ventilating trying to keep control of my emotions, the final hours were a replica of mine with my father and I was almost running scared inside looking for a way to not go through it as I saw it coming. You did enough M-R, you did everything he needed I was so sad that you felt you didn’t. I get such a feeling of release when he was physically with you (I know that’s not the best expression to use because he’s just with you and that’s that) but I get such a feeling of you know… when I take my kids on a trip, they have complete confidence in me, they don’t worry, they don’t fret, they don’t even really care where we are going, they know I’ve got it all covered. They clamber on and off and into and out of various forms of transportation, they take care of what they need to ie their own little bag and they lounge in seats, they doze off, they lose themselves in views and books and magazines, they relax, they have no stress, they enjoy the ride and the destination doesn’t even matter, they have confidence, a complete, unyielding confidence and surety that I’ve got it all under control. That’s how I felt when you were with him, that’s how I saw you as being so free that everything was an adventure and nothing mattered. I’m not as good with words as you so I hope you know what I mean by this. I felt this so strongly it was why I had to put the book down and use a box of Kleenex, that alone-ness (not a word I know but the only way to describe it) but it was that sense that then made me feel so proud of you and your Canberra journey, strange thing was, I didn’t feel proud of you as a reader, as a stranger, even as some pseudo maternal instinct, or all girls together, I had become so inter-twined with your love for your husband that I felt it vicariously through him or him through me and I think that is why it made me feel so happy that I truly burst and the flood gates opened like you’d never believe. I can’t even say why this all mattered to me so much because this is your story not mine but know that I needed to feel that, I needed to feel his pride in you even though he is alive in hearts and minds but not in body. I needed that reassurance that it’s possible and I don’t mean ghosts and spirits and all that. I think you know what I mean. I hope so. Bloody crying again, you’ve opened up some welded shut gates for me. Thank you. She’s amazing, she’s one of those people who I needed to come across in my life. If the whole point of my ever having heeded the call to take to blogging was to come across her then that was one of the best things I ever did. Wow. Now THAT’S a review worth writing a book for! Brava. Having recently read the book and written a review I couldn’t agree with you more. Your eloquent writing captures the essence of this wondrous life journey. Thank you! Do you have a link to your review so I can have a read and compare notes? I’ve read the Amazon ones after I finished writing mine. Here is the link from my blog. I hope you enjoy it. Thank you I have lots of reading for tonight when I’m settled down and recovered from today’s journey. You are so right about “She’s sowing Stringer seeds and growing a Chic crop and she is doing it so well.” I loved the book too. Although my reviews are always more analytical than emotional, this book did move me immensely too. I’m glad you understand what I mean, I was not sure if the analogy was right, but it felt right to me. He was one person who mattered so much to another person and yet through the book he will matter to so many more people. I just loved it, it brought out emotions in me which needed to be out. When I’ve dealt with them I might be more technical in a review but I am thinking more now about the whole feel of the piece and loving it again for different reasons. Do you have a link to your review? I’ve read the Amazon ones since writing my own and love to compare notes when I read anything of real significance to me. It’s sort of seen as visiting someone’s house and saying, “oh don’t stay here, come over to my house”. The link on your name in a comment can let people find you if they like what you have to say but otherwise, it’s polite to be invited to leave a link. Does that make sense? 🙂 so, thanks for inviting me! Yes definitely it does make sense. I’m relatively new to blogging and wondering now how many people I’ve offended :S But hey, we all make mistakes and we survive them. I feel more confident now about my blogging etiquette and it does make perfect sense. Oh, you probably haven’t offended many, if any. Decent people are generous to those who write and respond with a genuine heart … At least that’s what I believe! Wow!! What an awesome review! Now, I’m going to have to read it! Do read it. It has a very light and simple tone but then after I’d finished it and as I’ve not stopped thinking about it since, I realise that the beginning and the end (the bits without him) are far more penetratingly deep, introspective and reflective and I’m grasping for a word to describe the feel and all I can come up with is ‘lost’. While he’s with her she’s not lost, there is no struggle in her life, although there is perhaps more turbulence in terms of the things that are supposed to matter i.e. having a job, money, home – those things do not bother her because she is tied to a huge yet unassuming rock. That over-riding ebb and flow I realise is what made me feel so desperately sad and at the same time so happy for them both. That kind of explains to me why when I cried buckets I wasn’t sure if it was from sadness because time was up or because I was happy they’d had what they had. There are no spoilers in what I’m saying as it’s clear from the cover what the story is about… or so you think. It’s so much more than a ‘tragedy’. An insightful and perceptive review, with which I wholeheartedly agree. I just loved it. Such a different life to mine (especially the finding the perfect husband bit) and yet so much was familiar. I loved the dual aspects of learning something new and being reassured that “I’m not the only one”. I absolutely loved her book, and I loved your review of it! I know the feeling of finding a book like this, and not being able to wait until morning to write a review. That’s the best compliment you can pay a writer, and it means that I’m absolutely going to have to get my hands on M-R’s book! Do, I really feel there is something in there for everyone, it moved me for so many reasons. I hope you get around to reading it. M-R is who she says she is on the tin but you find there’s so much more to her from the book and it just make you warm to her even more. I’ve just bought this, so can’t wait. I’m sure you will not be disappointed. Goes straight to my heart! Great, wonderful, positive and still, some sorrow too…I have her book by my side here…waiting to be read and savoured, cried with and laughed with…When school is out I will read lying on the grass by the sea. Feeling the waves inside and hearing them rolling in on the shore. Great review that captures the love. Thank you and believe me there is no better way to read it. I am so glad I held back so I could immerse myself fully. Reblogged because Michelle’s review comes right from her heart and makes you feel you must experience this book for yourself. My copy of Margaret Rose’s book is on its way! I passed a milestone this last week 200 posts and as I saw the notification I thought I’d have a look at the stats and see what had been my most read post. I don’t really do stats, I write for me and for anyone who might be inspired or interested or who is just so bored they have nothing better to do than read the ramblings of a middle aged fat British chick. So this was my most read post and as such it’s getting a reblog on the premise that it interested so many people before and maybe there are more who it might interest who didn’t catch it first time around. I’m delighted that my most read post wasn’t even a post derived from my own grey matter if you like, but was prompted by the reading of a book by a blogger I follow and it warms my heart to see blogging community spirit at its best. I never really check stats but thought whatever my most read is I’ll reblog it and this was the one. I read somewhere on another blog about reblogging, I’ve not done it before with my own posts but I didn’t think that they might reach a new audience who finds them useful or informative especially as our networks build. I didn’t want to just randomly select one so this milestone prompted me and I hope it brings more people to read M-R’s fab book. This is a brilliant review. My day was moving slowly until I read this. Thank you and thanks you Margaret-Rose. Thank you, I’m glad that you enjoyed it. I feel my re-blog was justified and my thoughts on M-R’s work have now been shared wider which pleases me immensely. I must remember reblogging when I have something interesting to say and do it now and again. I have been fortunate to meet the irascible (sic) M-R in Sydney this last month, and have also recently read her book. Your review says everything. She is a wonderful person, and I only hope she has come to love herself as much as her Stringer obviously did. You are so lucky to have met her, I imagine a meeting with her would be huge fun. I felt the same about her, wished she could see in herself what he saw and what many of us who follow her through her blog and website see.